Home Costs > How Much Does it Cost to Repipe a House? How Much Does it Cost to Repipe a House? Repiping a house restores, repairs, and/or replaces the pipes that are installed in your house and is often done because the water pressure is low. Low water pressure, if you’re experiencing it, often means your pipes are corroding and are in need of a replacement. 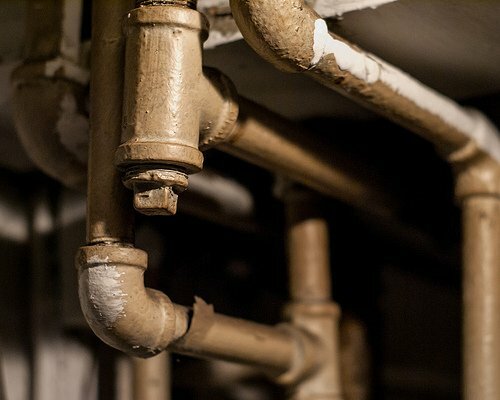 Since these pipes are hidden within the walls of your house, the cost to repipe a house can be expensive and messy. The cost to repipe a house usually depends on the type of pipes you’re going to use, the contractor performing the job, the size of the home, geographical location and complexity of the job. On average, plan on spending anywhere from $2 to $6 per square foot of the home, depending on the factors mentioned earlier. For example, from our research, a 1,500 square foot home with two, three or four bedrooms could cost around $3,500 to $7,500 to replace the whole home, while a bathroom alone could cost less than $1,000. From our research, we had found that flexible Pex-like piping will be a lot less than a durable material such as copper, sometimes up to 50 percent less. If you do choose cooper, it will be quoted on the weight, either K, L, M, listed heaviest to thinnest. The heavier the piping is, the more it can cost. According to one member on Houzz, she said she had received two quotes for her 1,767 square foot home. One was for $3,200 while the other was for $20,000. The big difference was due to the fact that one company was considered to be a franchise while the other was a smaller mom and pop organization. In that same thread, someone claimed they had paid $2,995 for a 1,600 square foot home. House Logic says the average 1,500 square foot home will cost anywhere from $4,000 to $10,000. We were able to get quotes from plumbers across the country and listed what we had found in our table below. Keep in mind that these were “estimates” based on what we explained over the phone. Before the job begins, a plumber will include a detailed outline explaining the amount of work that’s required and the materials the company will be used. If the plumber is going to outsource any work, such as replacing the drywall to a drywaller, then this should be noted as well. This will all be done after a visual inspection. Re-piping will often be done via PEX piping, which is a flexible tubing made of a cross-linked polyethylene, a PVC/CPVC, which is a plastic pipe made of chlorinated polyvinyl chloride, or copper. PEX is often a cheaper option since the plumber won’t have to tear apart the whole wall because the piping is often flexible and is able to be snaked through the walls with ease. Plumbers also recommend PEX due to its non-corrosive features and its ability to retain heat. Copper, on the other hand, can be pricier since more of the walls have to be opened up, but it is known to be bacteria resistant and isn’t UV-resistant, being able to be installed outdoors. During the process, all pipes that need to be replaced within the home will be gutted out and replaced. Drywall will be torn apart in separate sections, just enough so the plumbing is exposed, being replaced later. Some of the most common reasons people repipe a home are due to the age of the home or the homeowner’s preference to change the piping material. Most plumbers prefer to work in the attic to maneuver around to run the new piping through the home’s interior walls if the attic is possible; however, if an attic isn’t suitable, then they will either consider working underneath a floor via a crawl space or in the ground, running the piping outside the walls. This is often done on slab-on-grade homes with no attic or crawlspace. Depending on the size of the job, a permit may be required. This will depend on where you live, but most of the time, it should be in the $100 to $400 range. The number of stories could increase the costs since the higher the home is, the higher the plumber will have to work. The same can be said about the number of sinks, showers and bathtubs that need to be reconnected. When choosing a contractor, always make sure they are licensed and bonded. It also doesn’t hurt to check their reputation on review websites such as Yelp and/or Google. Copper piping is known to fail due to water, soil or even defective material. If it were defective, according to mcgarryandmadsen.com, the piping can fail in as early as six to eight years. If it were to fail, the first place it would start to leak would be beneath the slab. PEX pipe will always be 75 percent cheaper than copper pipe, so unless you have your heart set on it, there’s no reason to choose it. As you can see above, quotes can be all over the place and that’s why it’s so important to get at least three to five quotes from local companies. If you’re unable to get the quotes, that’s okay, too, because there are free online services that can do it for you such as HomeAdvisor.com. With HomeAdvisor, you simply describe your job and local reputable and licensed contractors will email/call you with a ballpark quote. In our research, it’s okay to choose a franchise-based business, but be forewarned: If you do go this route, make sure you get a quote from a local mom and pop as well.